Welcome all to the third installment of Vanity+Vintage! It has already been a pretty wonderful, yet busy week so far. Sifting through a few boxes and storage containers inside of my closet I found a few more stylish items that (have three colours) I'm very much loving at the moment grey, red, and navy. I completely forgot about these beautiful Italian shoes that were a gift from my parents many years ago. I adore the tiny tassels. Red, navy, and white seem to compliment any outfit in a classic way, and this ensemble makes me feel content --- as if I'm absolutely ready for a nice holiday & soon please!! This jacket is a recent purchase that was made on the weekend. Of course I had to show my appreciation for stripes! I was charmed by the scale of this tassel, especially paired with the loafers. I actually acquired it 7 years ago at a local jumble sale, so I added it as an adornment on my handbag. Guess what? I found an outfit to wear with my hat and vintage clutch! I say you are ready for a trip to Cannes. Stripes, red and navy go so well together. STOP IT! I was waiting for you to rock your hat...my gawsh you look smokin'! I hope you wore that going about your day, it look so great! I love your two red, white and blue outfits. 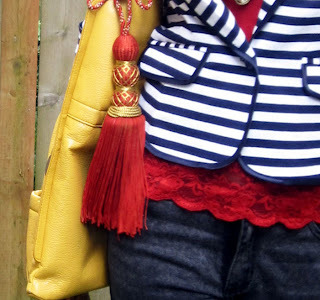 I wouldn't think red lace would work with a stripe jacket, but you pull it off beautifully. And that hat is so cute! I love both of these looks, navy and white and red is definitely one of the best color combinations and that YSL skirt? Swoon!!! The striped jacket is awesome- love the nautical feel. And the second look- perfect for turning heads!! Fantastic YSL skirt!!!! i love it all and the hat is uber chic! OH MY GOD YOU ARE SO CUTE. Seriously. I just...AH! I don't even know where to begin! Each of these outfits is so so chic and patriotic and retro. I love the little red and white shoes in the first one!! I really love the two outfits. You used the shoes so differently in each outfit, and kept it really chic. Great feature. I just have to say you are amazing! Look how you styled your stripes and loafers! You are just too much. Ok. Seriously. You're one hot lady! I am in love with your flats from the first photo. but in LOVE! I was so excited to find this YSl creation, so comfortable so chic! Thank you! Alexis, you're so funny! Hopefully a few heads turned... struct by fashion, haha! I adore nautical everything.. I used to go on my grandfather's boat when I was young, that was the beginning of my love for navy and white! Thanks for the comment! Your first outfit is super cute. Your second outfit is amazing!! You look gorgeous, like a pin up!! I love your outfits, especially the red and white one! Great styling! Thanks so very much Zarna! I love it! Awesome accessorizing. I want your shoes and cute little tassel. wow loving the first look.. the red and the red and white shoes! the nautical themed blazer and hat and a nice lick of yellow with the bag, gorgeous! Madison, hold on! I LOVE red white and blue combo. I think it is classic summer time colors. YOU look stunning, set to sail on some yacht and I love those tasseled loafers- swa-heet! awww! Jelena, that means alot to me, thank you! Stripes are fantastic! enjoy your weekend!! Thank you Arash! Yes, I thought that a splash of colour (yellow) was needed! :). Enjoy the weekend! Oh my gosh. Totally loving that blazer! Just found your blog! Now following, hope you'll follow back!! Yaaaaaay!!! I'm so happy you wore it out. It so works on you! That is a hero move right there, friend.